Oh, readers, you are in for quite a ride. 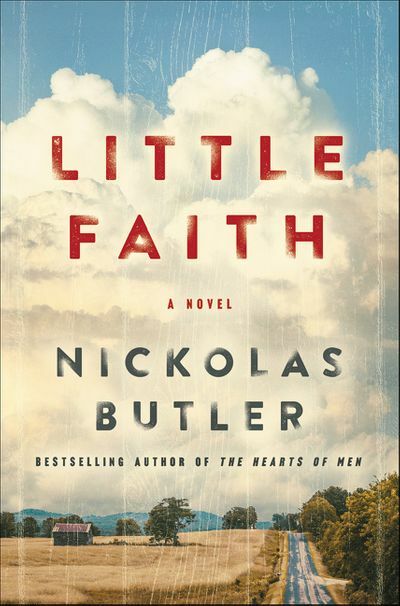 If you’ve yearned for a fine novel like those by Kent Haruf and David Rhodes, Nickolas Butler’s Little Faith is the novel that you who adored Plainsong, All Souls at Night, and Driftless will love. Opening with a scene in a small cemetery where 65-year-old Lyle is entertaining his beloved five-year-old grandson Isaac while his wife Peg and daughter Shiloh shop in Minneapolis, the novel quickly delivers the reader to a quiet way of living. Lyle opines, “The world, he knew, was divided into two camps of people, as it so often is, or as it so oftentimes and simply reduced to being, those who find cemeteries places of sadness and eeriness, and those, like him, who felt here a deep and abiding unity and evenness, as if the volume in his life were suddenly dimmed down, the way he imagined it might be, floating in outer space, looking out over everything – the immensity of it all. For Lyle, this was a place to be close to people long gone. A free and quiet place off to the side of things. A place to touch not just his memories, but his future.” Lyle and Peg’s first child, son Peter, who died when he was an infant is buried in this cemetery as are the others Lyle fondly remembers from a lifetime spent in the area. Daughter Shiloh grew up in the Lutheran Church in their town, but “her faith had grown in ferocity since her childhood. She no longer drank even so much as a light beer, a margarita, or a Bartles & James, and insisted on prayers before every meal. She wore more conservative clothing, quoted scripture frequently, and challenged Lyle and Peg with questions of their own faith. On those Sundays, since she and Isaac had moved back home, she politely attended church with her parents, only to visit another church later, this one in La Crosse, in an old movie theater. And she would spend her entire afternoon and early evening there, in fellowship, she would explain. Lyle understood churchly fellowship, but only in the context of two or three mugs of wan coffee and polite chitchat, after which, wasn’t it time to head home and mow the lawn? Or rake some leaves? Perhaps clean the gutters or pull weeds? Since his retirement, Lyle had worked part-time in an orchard and he cherished days spent there and loved it when Isaac accompanied him and they shared apple cider and lunch together amid the apple trees. “Oh, he loved the boy; and that was all there was to it.” So when Shiloh asks Lyle and Peg to attend her church, they go and keep going despite Lyle’s dislike of the rock music and of Steven, the know-it-all young man wearing “new blue jeans made to look old,” who is the pastor of the church. Soon Shiloh and Isaac move to be near her new job, church, and Steven who becomes her fiancé. While Lyle feels that he’s always on eggshells around the “new” Shiloh, he’s willing to give up a lot to be near Isaac. But all that is tested when Isaac becomes ill and Shiloh and Steven insist that their faith will heal him. What happens tests all of them and the beauty of the way Nick Butler tells the tale, is that every reader will see what’s happening through their own beliefs. Butler brilliantly divides the books by the seasons beginning and ending with spring and thus embeds the reader in the cycle of life that the book shares. He also uses nature, particularly the apple orchard to show that for Lyle the land and the orchard are Eden thus it’s extraordinarily difficult for him to see why anyone would leave that paradise for false idols. This is a novel for everyone and it’s one that’s almost impossible for this reader to review because I want to share every word of it with you so that you, too, will feel the beauty and comfort of it washing over you. That Nick Butler isn’t yet forty proves the words of Acts – “your young men shall see visions, and your old men shall dream dreams.” Nick Butler provides the reader with an exquisite world complete with a dreaming older man who shows us the way. I’ve loved all Butler’s novels, but with this one, he’s created holy ground. Summing it Up: Little Faith is the novel readers have been wishing for since Kent Haruf’s All Souls at Night. It’s an engaging, thought-provoking tale of a grandparent’s love for his grandson and for the life he’s blessed to live. It’s a novel of gratitude for the natural world and of the threats to the things we hold sacred. Give yourself a gift, read Little Faith. It’s an epiphany wrought on paper.